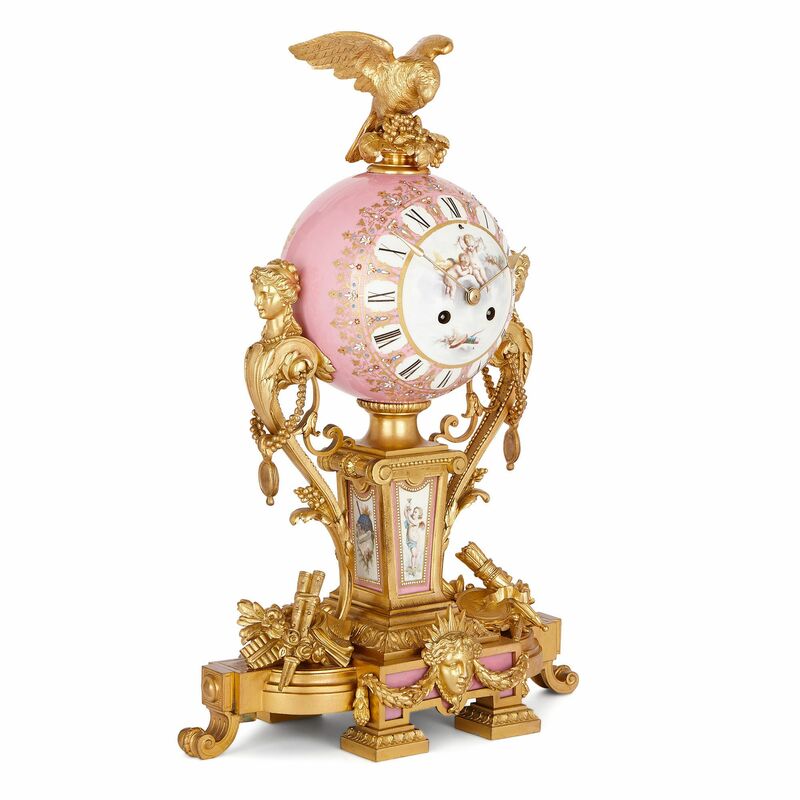 This beautiful pink porcelain mantel clock is decorated with charming Sèvres style paintings of cherubs, and with fine classically-inspired ormolu mounts. 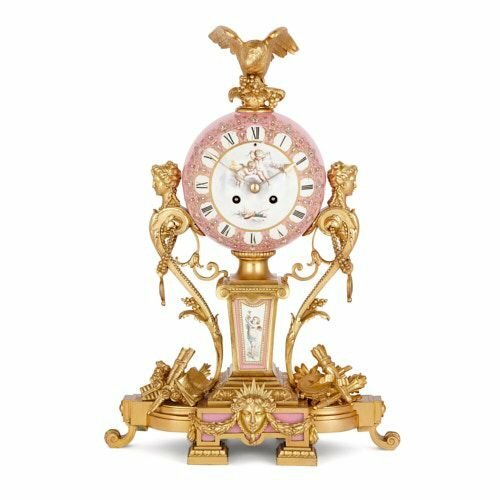 The clock is set on a shaped oval ormolu plinth, which is raised up on six feet (four square and two scrolled). 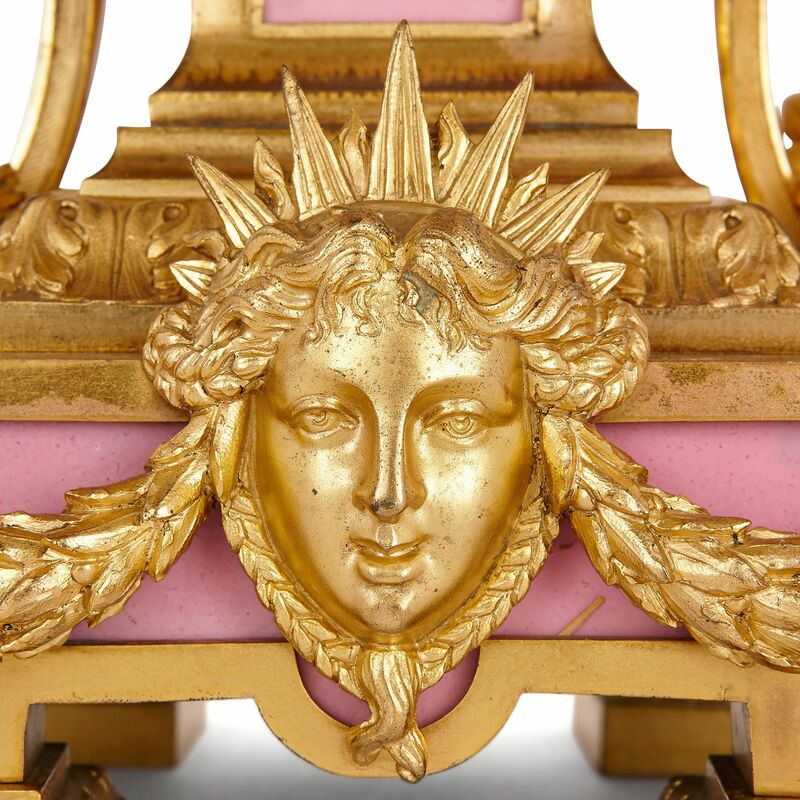 The base is decorated with a light pink porcelain panel on its front, which is mounted with an ormolu classical female mask. On the shoulders of the plinth sits a group of ormolu musical instruments, and a collection of ormolu weaponry. These forms are perfectly balanced, so that the shape of an aulos (a classical wind instrument) on one side is complemented by a quiver of arrows on the other. 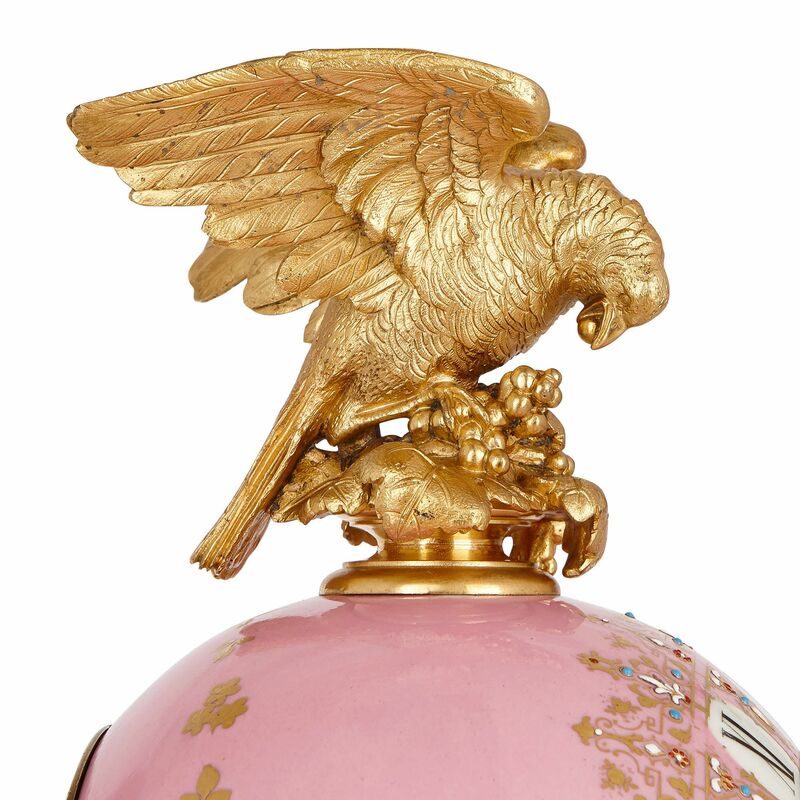 A light pink porcelain pedestal, its shaft decorated with an image of a cherub, stands on the ormolu plinth. This has a foliate ormolu base, and an ormolu Ionic capital. The pedestal is topped by a waisted ormolu stem, upon which rests the circular dial of the clock. 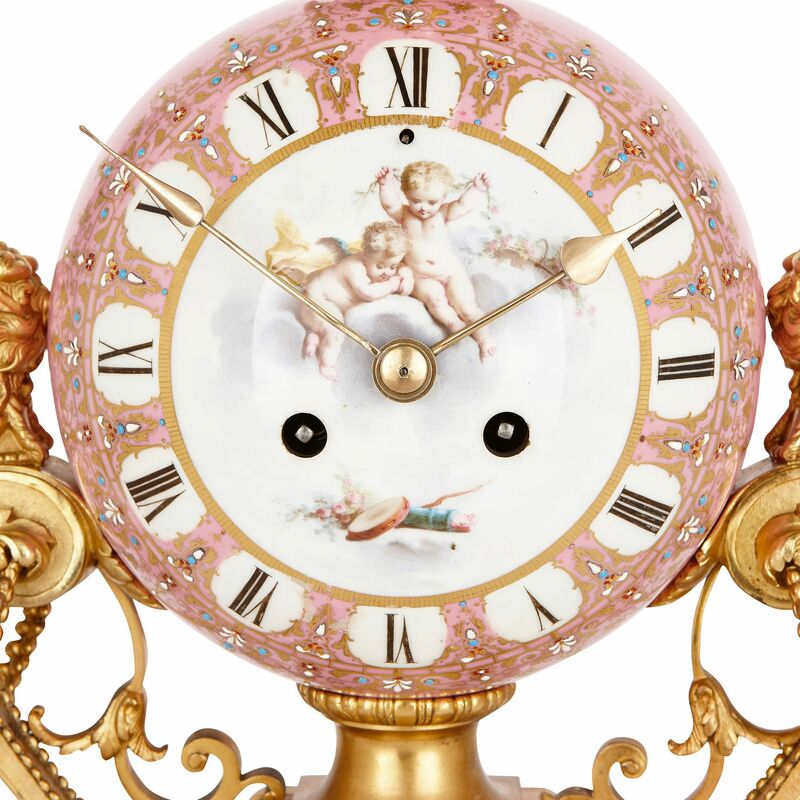 The circular, light pink porcelain clock dial is decorated with black Roman Numerals, and is painted, at its centre, with an image of two cherubs, one playing with a flower garland and the other resting on a cloud. The dial is edged with scrolling gilt and jewelled ornament. 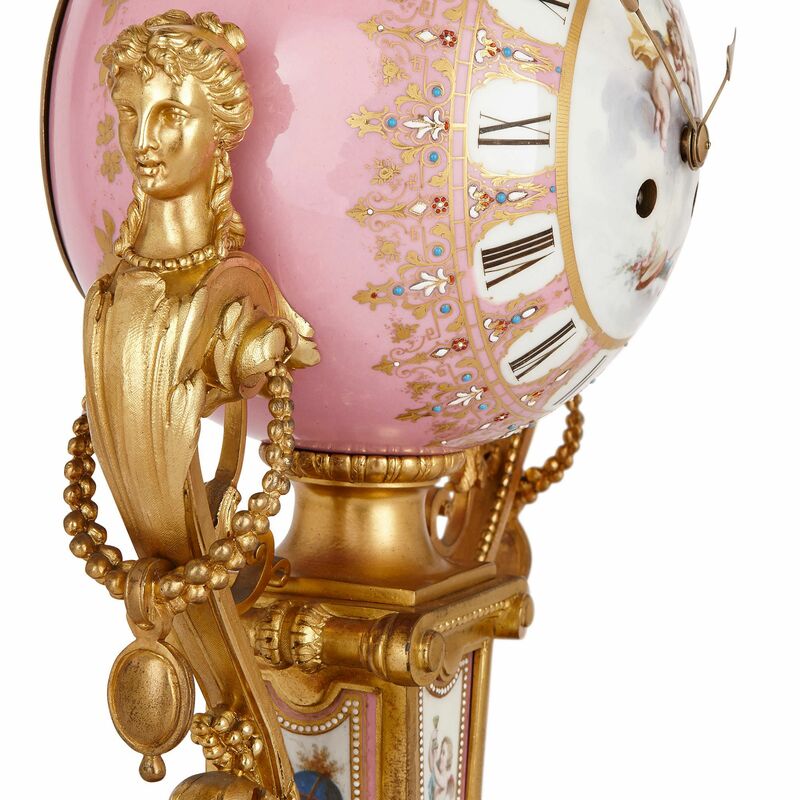 The dial is mounted with two ormolu handles, with classical female bust tops and scrolled, foliate stems. An ormolu dove tops the circular porcelain dial. The dove holds its wings back behind it, and arches its neck to peck at a cluster of ripe grapes. 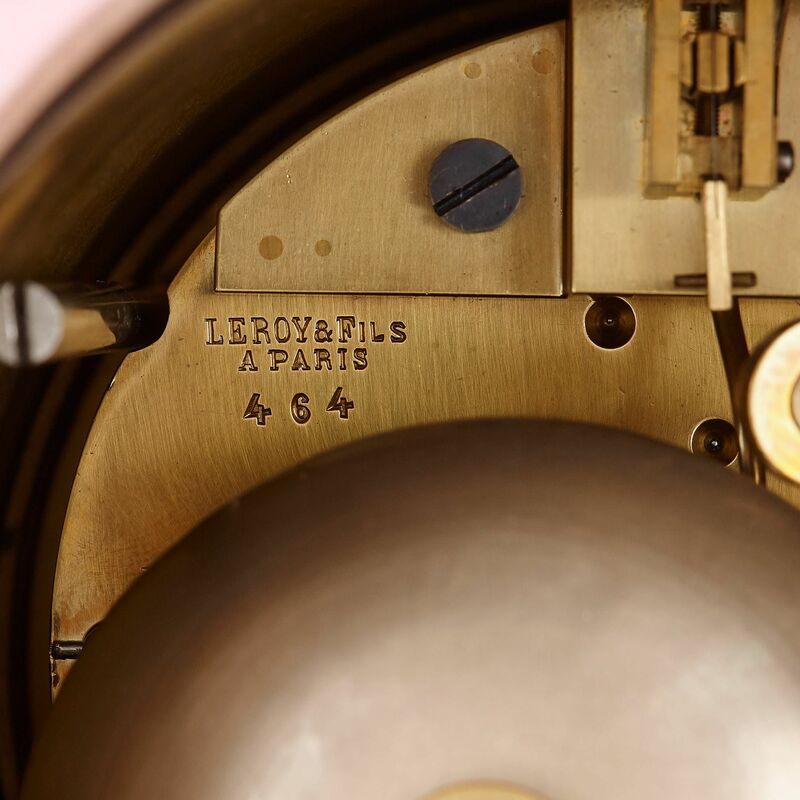 The clock movement is signed with the manufacturer’s name, ‘LEROY & FILS A PARIS 464’. Founded by Basile Charles Le Roy in 1785, Le Roy et Fils was a prestigious clockmaking firm who supplied to major patrons, including the Emperor Napoleon in France and Queen Victoria in England.